I think I’m late on the stuffed-cookie train, but my goodness am I in love. I have made 3 batches of Picky Palate inspired oreo-stuffed cookies in the past 2 days (click here for some great step-by-step photos! 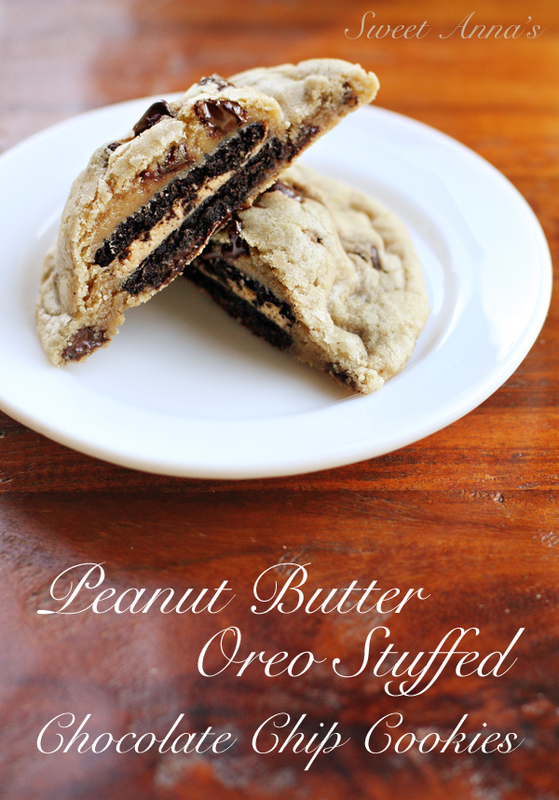 ), and I can’t stop dreaming of all the other things I want to stuff inside a cookie! I am having so much fun using my favorite, perfectly chewy Chocolate Chip Cookies recipe and stuffing them with sandwich cookie goodness. I seriously don’t know how I missed out on this trend for so long. These cookies are just so fun, not to mention delicious and addictive! If you only bake one more batch of cookies in your life, make it these ok? In a small bowl, whisk together the flour, baking soda & salt; Set aside. Beat in the flour mixture until just combined and then stir in the chocolate chips. Place the cookie dough in the fridge to chill for about 30 minutes while you preheat the oven to 325ºF and line some baking sheets with parchment paper. Using a medium cookie scoop, scoop out several mounds of cookie dough onto a plate or piece of parchment on the counter. For each cookie, take one cookie dough mound in your hand, place an oreo on the flat side and then sandwich it with another scoop of dough. With your hands, gently spread and form the cookie dough to cover the oreo completely. Place on the cookie sheets allowing some space for spreading and bake for 18-20 minutes until the cookies are very lightly golden brown around the edges... under-baked is good! Remove them from the oven, leaving the cookies on the baking sheets until they have firmed up enough to lift off the pans... around 5-10 minutes. Enjoy as many as you want warm and freeze the leftovers! !